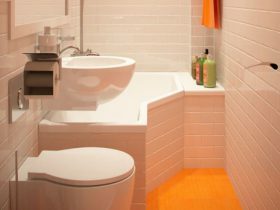 When it comes to planning for a small bathroom design in an apartment, photos of some of them can be viewed below, people immediately faced with lots of problems, associated with its functionality and usability. 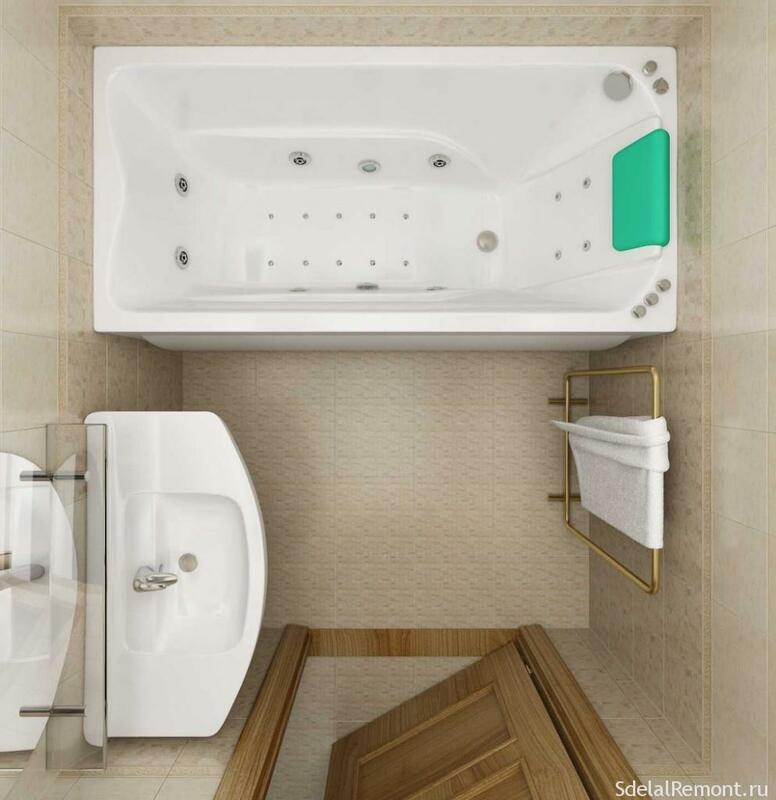 After all, it is necessary to not only comfortably take a shower or bath, but could also accommodate a washing machine and sink, not to mention a bidet and additional attributes. And in the apartments with small families then still located and toilet, it also reduces the effective area of ​​at least ¼. To most efficiently accommodate all functional elements of a toilet on the square just 2 meter squares with small change, you need to think carefully. Work out various options and view a lot of ready-made solutions on the Internet. 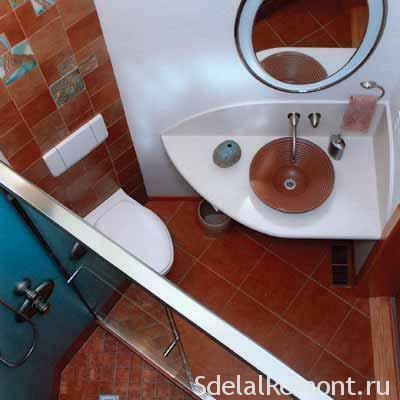 Internet will be a great help for the selection of the most appropriate way to design a small bathroom design in the Khrushchev with standard dimensions, but what to do, if you have irregular or arbitrary shape, at all, built his own private house. Modern interior of a small bathroom can actually how to incorporate all the functional components of separate sanitation facilities, so some of them may be combined. 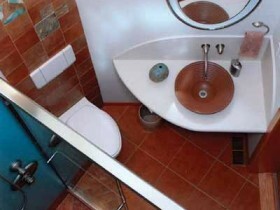 for example, in a small bathroom is not always rational to install a separate sink for added comfort. 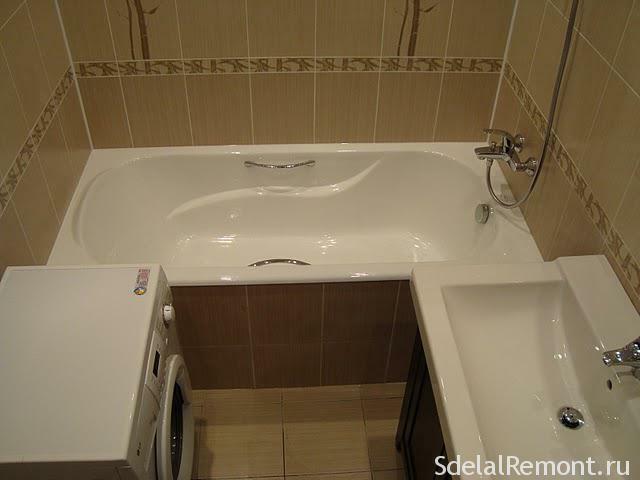 It is better to combine it with a bath, mounted a separate mixer in a convenient location on it. In this case, all communication is best to hide in the walls. If, however, there is an acute need for the separation of functions, you can use a compact shell and place it over the bath. In this case, the latter should be narrowed to the edge for ease of use. Such a method would be relevant in a family of several people, when often there is a need to use the toilet and bathroom for two people at the same time. Functionality - if you make the main slope of the utility of space, the, Unfortunately, you can not always take into account the parameters of comfort and relaxation. 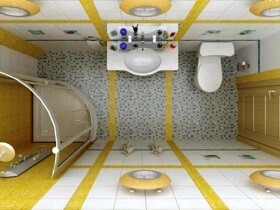 Practicality - is important, to use a bathroom pleasure, but then you have to sacrifice some of its functionality. Large bathroom absorb part of the space, where you could install a washing machine. 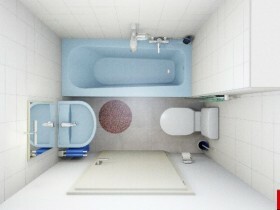 The balance of the first two - in the bathroom can be conveniently post shower, sink and toilet. Washing machine then you have to build elsewhere. Good advice, how best to install a washing machine in a small room. In terms of electrical arrangement of the washing machine in the kitchen or in the hallway is the best option, because it is highly probable short circuit fault at high humidity. And that could lead to accidents. The small footprint of the bathroom is a weighty argument for those people, who wish to gain from the process to wash the maximum pleasure. And they can not give up the big and bulky font. Then sink and washing machine, probably, have to sacrifice. And quite sink functions can be performed and the bath itself, but then it will often be necessary to wash it or use it should be less than. When you create the ideal is always something you have to sacrifice, and let it be auxiliary functions, not the main. 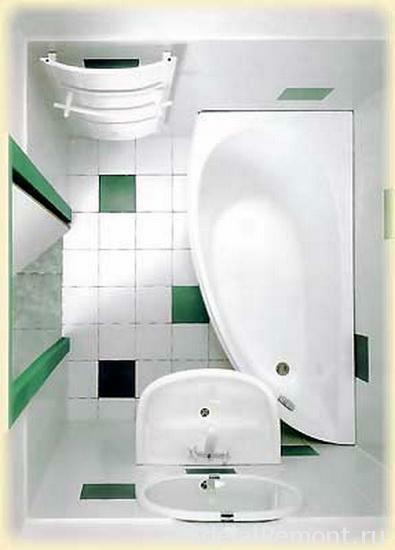 Often the design of a small bathroom in the 2 quarter. m depends on the number of members in the family and in the presence of her young children. It is no secret, that bathe a small child more comfortable in the adapted and the best possible conditions. That's what is more appropriate, or, at least, queen-size bath. It has to be taken into account in the preparation of a unique design, but there is enough options for thought. Today, commercially available baths and pallets with dimensions 0.7, 0.8, 1, 1.2, 1.4 m, that provides the ability to create the most comfortable conditions for child, while still leaving enough space to install the sink and even a washing machine. In families, who do not have young children, of course, urgent use for cleaning showers and screens. 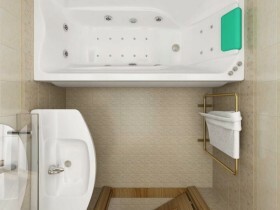 Adult enough and in a standing position to take a shower, if the desire to comfortably take a bath do not outweigh the flexibility and compactness. Options for a unique interior design small bathroom infinitely many. You can spend days to view unique photo and video artists on the Internet, collecting the best ideas from different designers. But the main thing when building your own unique and unique interior is a harmony. 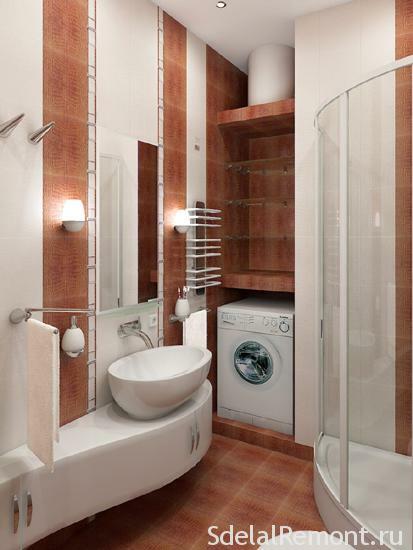 All elements in the bathroom should be the maximum combined with each other or be complementary to each other. 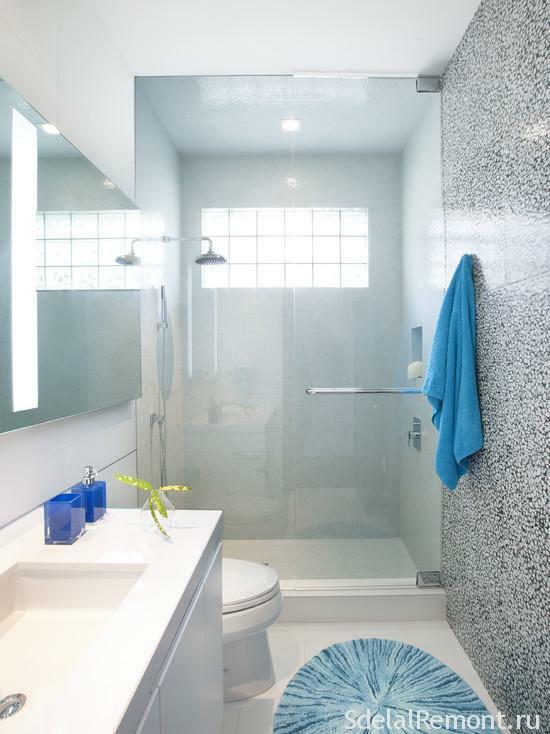 Smoothly flowing curves of the bathroom should merge with protective screen, forming integrally. 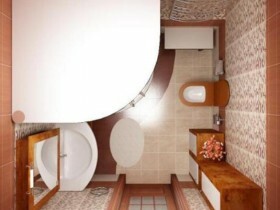 Ideas in the design of bathrooms 2 sqm lot. Someone thinks, that all the angles and lines should be smooth, curving. Someone sure, that strict straight edges, compactly drawn to each other - this is the best solution for a way out. 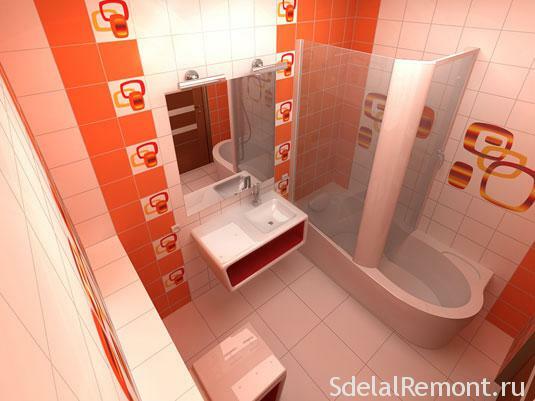 The task is not to impose any styles and ideas, here you will find options for bathroom design with small dimensions. 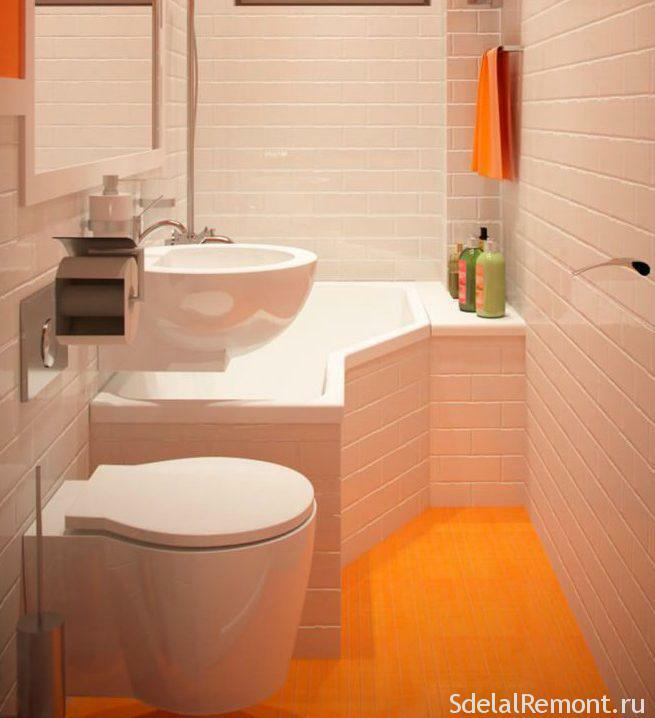 Video: HOW do spacious design small bathroom! In a room with a small size in the forefront in the design of the design stands, of course, saving valuable space. That is why the best option for wall decoration is a tile. 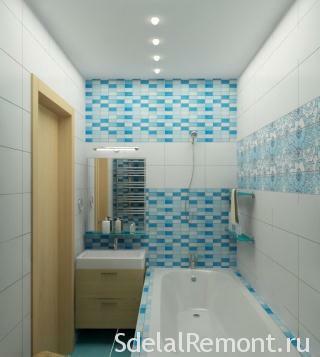 Tiles for a small bathroom should be thin and light tones necessarily. In such a small space, it is important to combine the bright and warm shades, they will help to further expand the space visually. Also in the design of a small bathroom becomes superfluous use of diagonal lines, distort space and form, visually increase the volume of. Here are the photos of finishes small bathroom tiles, which designs, as well as the views of the masters, lots of. If you decide to do repairs, that is something to work on and what to take as a basis. And our site will help to understand the repair. 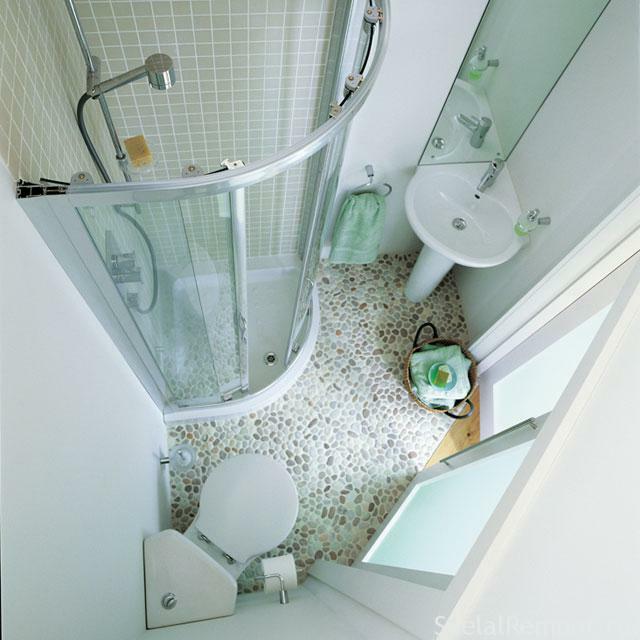 Floor tiles for a small bathroom, Photo is a huge number of options can be found, It will also be an ideal solution. This type of coverage will not only provide the best appearance of the restroom, but also create an excellent water-resistant flooring. tile laying method, undoubtedly, It plays an important role. Installation of tiles diagonal method will enable visually expand the space. 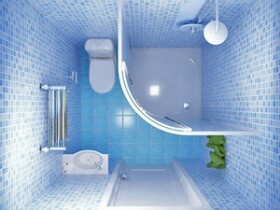 bath tiles, photo which presents a lot of the World Wide Web, perfectly with any kind of walls and ceiling. must, to floor, ceiling and walls combined with each other, It belonged to a single line or shades, at least, They were in harmony. for example, always well combined white and brown, yellow and light green and other combinations warm shades. It is possible to increase the visual space by Use different method of laying. 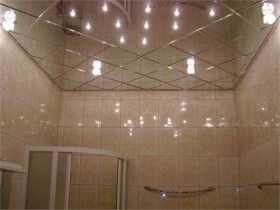 The main tasks for finishing small bathroom, Photos are represented on this page, is the conservation and extension of a visual, so as finishing the ceiling should not be used suspension structures. It is best to impose its tiles or perform tensioning of polyvinyl chloride. This type of finish will not only provide excellent waterproofing floor slabs, but will give the room an extraordinary beauty and uniqueness. Stretched canvas can be ordered with a stamp of a pattern, eg, celestial dome or anything else like that. A tile can be used mirror. 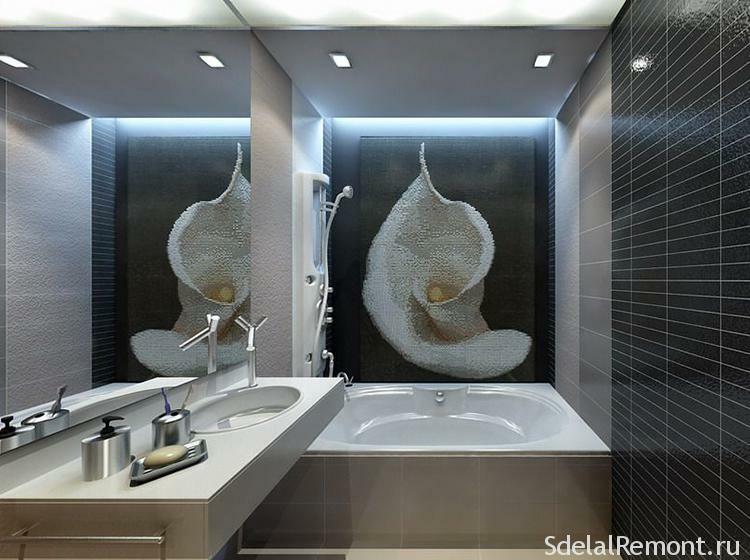 An important stage in the design of a small bathroom in a modern style is lighting. What is brighter, all the better. But not everyone agrees with this statement. It is necessary to rationally choose the light sources and at the same time it is best to let it be spot lighting. A couple of the brightest sources of power in 60 W provide good lighting performance, and it does not create a feeling of being in the operating. One of the great ways to visually expand the space in a small room will be the use of mirrors, moreover, not small, and large. They can be installed above the tub in the size of the entire wall, and will go well as the doors to the locker, perfectly combining several functions. Some people prefer to mirror not only the walls, but also floor and ceiling. Tiles for a small bathroom with a mirror coating completely provide a visual extension of the space. It is important to take into account the color combination in the interior. For the sake of saving space sink is best to use a small and elegant leg, and not on the big and massive pedestal. You can also set the hinged shell, and communication to take place in the walls, this will allow it to place a compact washing machine or a laundry basket. 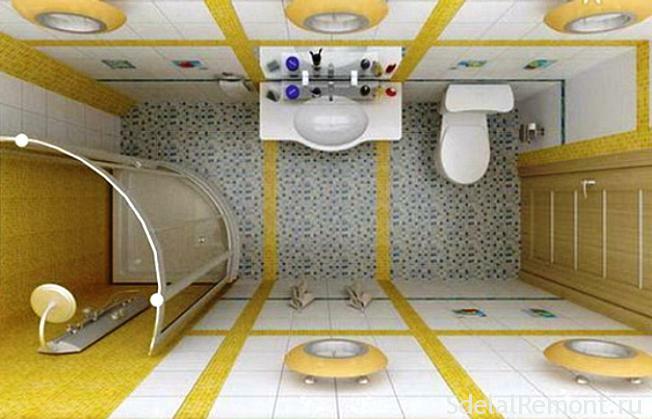 The video shows another solution for bathrooms with small dimensions.